ELC Whizz World Racing Car Magnetic Trio Se..
Theo Klein Bosch Parking Garage 1+ (2 Level..
ELC Whizz World Emergency Vehicles Magnetic.. Skip Hop Explore & More - Pull&Go Cars - Be.. Skip Hop Explore & More - Pull&Go Cars - He..
Moulin Roty Les Petites Merveilles Toy Trai.. Haul cargo, imagination and plenty of fun in the Green Toys Pick-up Truck. Made in the USA from 100% recycled plastic, this truck comes with 1 farmer cow and features a classic open-bed, ready for play! 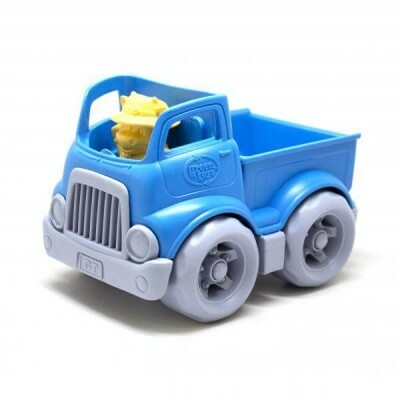 This pint-sized truck is just right for little hands, and can easily be tossed in a diaper bag for on-the-go fun. Built to last with no metal axles, this truck is made safe for children and the earth they play on.